Wireless audio is getting a lot of attention these days. Platforms, such as Bluetooth provide consumers with the ability to stream audio content from compatible portable devices to many home theater receivers. Also, closed systems such as Sonos, MusicCast, Heos, PlayFi, and more, provide flexible wireless multi-room audio listening. In addition, there are also an increasing number of wireless subwoofers, and wireless audio systems, specifically designed for home theater applications. Unfortunately, most home theater gear in use does not have any wireless connection capability. On the other hand, why toss a perfectly good stereo or home theater receiver, or subwoofer just to eliminate a long cable run? What if there was an inexpensive and practical way to add some wireless capability to the home theater components you already have? One practical option for adding a wireless audio capability to your home theater setup is the Atlantic Technology WA-60 Wireless Audio Transmitter/Receiver System. The system comes with two components: A transmitter and a receiver. The transmitter is equipped with a set of RCA-type analog stereo audio inputs, while the receiver is equipped with a set of analog stereo outputs. The system uses the 2.4GHZ RF transmission band and has a maximum range of 130 to 150 feet (line of sight)/70 feet (obstructed). For added flexibility, the transmitter and receiver provide 4 transmission channels - so that multiple WA-60 units can be used without interference, or minimize interference with other devices you might have that use similar transmission frequencies. In terms of audio transmission quality, the frequency response of the system 10Hz to 20kHz, which covers the entire range of human hearing, including those low subwoofer frequencies. The WA-60 Kit comes packaged with 2 AC power adapters, 2 sets of short RCA connection cables, and 2 sets of RCA-to-3.5mm Adapter cables. One practical way to use the WA-60 is to make any powered subwoofer wireless. All you have to do is connect your home theater receiver's subwoofer preamp/line/LFE output using the provide RCA audio cable to the inputs on the WA-60 transmitter unit, and also connect the provided RCA audio cable from the audio outputs of the receiver unit to the line/LFE input on the subwoofer. Also, although both the transmitter and receiver both have stereo connections - if your home theater receiver only provides a single output for the subwoofer (which is the most common) and the subwoofer only has one input, you don't need to use both of the inputs and outputs provided on the transmitter/receiver units, but you always have the option of using an RCA stereo Y-Adapter if you want to. It must also be pointed out that if you have more than one subwoofer - all you need to do is add an additional WA-60 receiver(s), which eliminates even more possible cable clutter. Another practical use for the WA-60 system is adding an easy connection for the Zone 2 capability that is available on many home theater receivers. The Zone 2 feature on a home theater receiver is a great way to send a separate audio source to a second location, but the problem is that you typically need long cable connections to do it. However, by plugging the Zone 2 preamp outputs of a home theater receiver to a WA-60 transmitter, and then placing the WA-60 wireless receiver in another room, with its audio outputs connected to a two-channel amplifier or stereo receiver/speaker setup, you can add the flexibility of having a Zone 2 setup without all the hassle of running a long cable between two rooms, either along the floor or through the wall. Using a system like the WA-60, you can now enjoy that Blu-ray disc movie in your main room and someone else can listen to a music CD in another room, even though both the Blu-ray Disc player and CD player might be connected to the same home theater (with Zone 2 capability), without all that cable clutter. In addition to the use scenarios discussed above, you can also use the WA-60 Wireless Audio Transmitter/Receiver System to send audio from any source device (CD or Audio Cassette player, Laptop, PC, and more) wirelessly to a stereo/home theater receiver, or even most powered speakers. It is important to point out that the WA-60 system only transmits analog audio in either stereo or mono - it does not transmit Dolby/DTS or other types of surround sound audio signals. 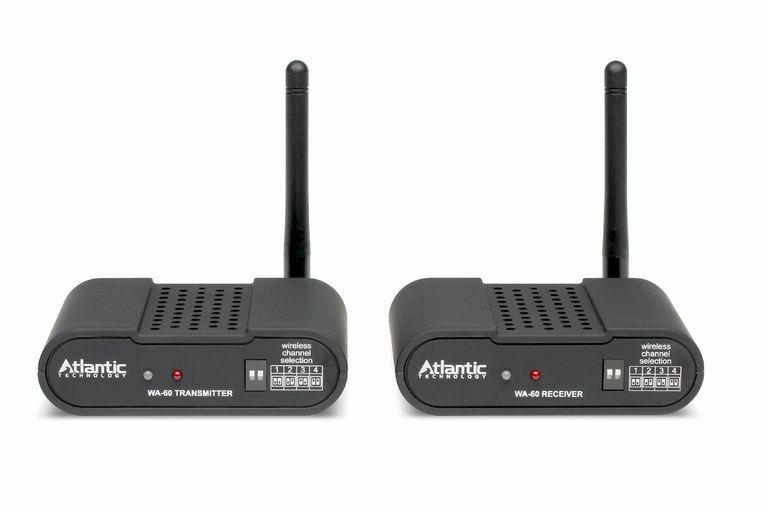 The Atlantic Technology WA-60 Wireless Audio System has a suggested price of $199 (includes Transmitter/Receiver/AC Adapters/Connection Cables). Zone 2: What Does It Mean in Home Theater? Is There a Real Difference Between Stereo and Home Theater Receivers?